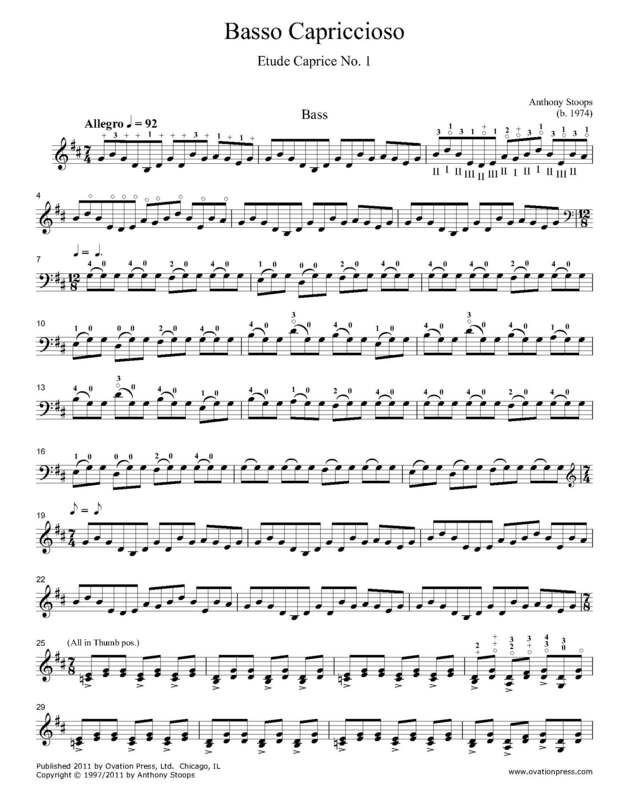 I wrote Basso Capriccioso in 1999 during a recording session for my first CD entitled Bass Fiddle. Bass Fiddle was a duo album that I recorded with my friend Andy Carlson featuring music for violin and bass in a variety of styles: classical, bluegrass and jazz. Compositionally, it’s kind of an “Eduard Nanny goes country with his ‘uptown’ boots” kind of thing and as such is a tribute to two of my favorite bass players: Gary Karr and Edgar Meyer. The main technical challenge of the work is the large number of string crossings throughout. Click here to listen to a recording of Anthony Stoops performing Basso Capriccioso for solo bass.